The Labyrinths of England and Great Britain are plentiful, historic and revolutionary. They come in all shapes and sizes though we know them for their turf construction, cultural acceptance and often mysterious histories. Whether its ritual, celebration or statement; England holds a bastion of wealth in labyrinth lore. Exploring is a wonderful adventure with the labyrinths of England. If you are at all familiar with labyrinths, you know they are not a maze, though a maze can be a labyrinth. The two are often confused and it is quite interesting to see notable art and literary works that are unclear or incorrect. It is thus delightful to discover the Archbishop’s Maze at Grey’s Court near Henley-on-Thames, west of London. It is both a turf maze and a labyrinth, if you walk the path you discover the labyrinth and if you stay on the turf it becomes the magical message of the maze. It is located just beyond the Kitchen Gardens. Commissioned in 1981, the labyrinth was designed with Archbishop Runcie’s enthronement speech in mind which urged the people to help each other unravel the maze of life. The labyrinth path is almost a quarter of a mile in length and at its center is a plaque that designates the four directions of nature as well as a junction of the crucifix. The seven rings of the labyrinth celebrate the seven days of creation and the entire design represents a crown of thorns. From the the religious intent to the spiritual opening all can come together in celebrating unraveling life’s mysteries together. Our journey is all about the coming together of questions and answers, ideas and actions and exploration that brings harmony to the opposites. There we will find our truth and our capacities. As England is rich with labyrinth availability and wisdom, let this be a mere introduction of the variety that awaits. Explore and discover further adventures from those who have come together to provide the lessons of the labyrinth in cultural appreciation in England and beyond. Explore the ways in which you bring two sides into one story. The Great Wall of China is a world wonder that is approximately 2300 years old and extends just over 13,000 miles through nine provinces. In the Northern section lays the Yangquan Shanxi Province that includes the Niangzi Pass also known as the Ladies Pass to honor the garrison that hosted an army of women led by the daughter of the first Emperor of Tang Dynasty. There is much that honors the feminine contribution in protection of its people in this area of the Great Wall. This might make it not so surprising to discover a labyrinth that is called a maze yet is a labyrinth at the ground level near the Ecological Gardens. 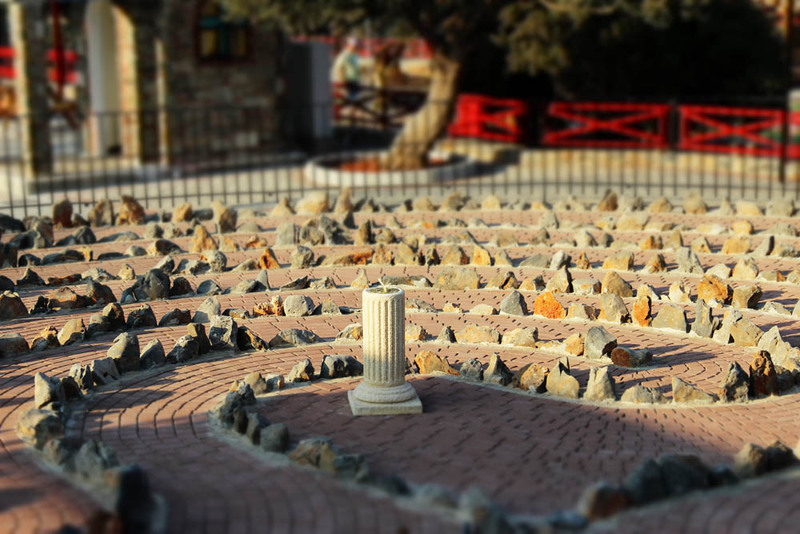 It is called the Philosophers Maze and where it creates a labyrinth in one area, it extends to traverse through the entire garden structure. Golden statures of soldiers remind of defense, while a gallery of Calligraphy balances with the wisdom of expression that enhances the ambience of the environs. It is said that the philosophers walked the labyrinth with an idea and by the time they came to the end, they had manifested their calligraphic story. The exploration and discovery of this labyrinth was a journey of search and research as its subtle existence was present, though where it could have led to dead ends and confusion, it turned into a labyrinth with an open mind to discover what else might be significant and related. Each clue led to another and soon the labyrinth revealed itself. The difference in all was the ability to look for possibility and be open to explore and discover with clear intent. Turning a maze mind into a labyrinth is to look past what appears to be a dead end by appreciating and turning into a new beginning. Explore your relationship with labyrinth and maze today, do we turn one into the other for a useful outcome?